Qantas has begun its $250 million cabin refurbishment program for nine of its Boeing 747-400s, with each aircraft to be fitted with new, Airbus A380 style seats and inflight entertainment systems by the end of next year. The 747 refit project will see seats, electrical wiring, fittings, galleys and inflight entertainment stripped from the aircraft and replaced with new cabin fittings, A380 style seating and Panasonic inflight entertainment and various other features, including a self-service snack bar in economy class. Each 747 will be configured with 364 seats, with 58 lie-flat Skybed business class seats, 36 for premium economy and 270 for economy. 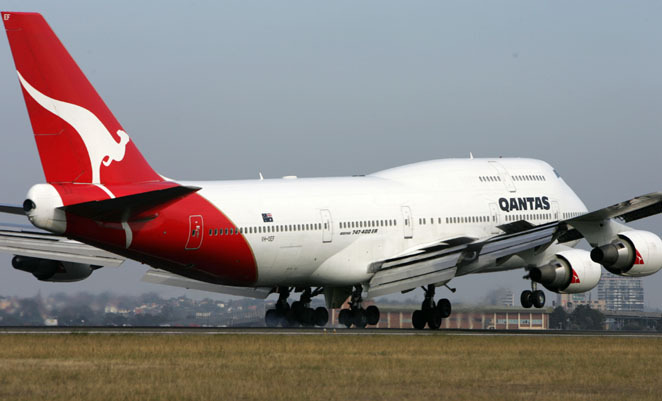 “Since Qantas introduced the A380 in October 2008, there has been unprecedented demand for seats on these aircraft. This refurbishment program will give more passengers the opportunity to fly to more destinations with a premium flying experience,” Qantas CEO Alan Joyce said during a visit to Avalon Airport’s Qantas heavy maintenance facility on Friday. “The project was awarded to Avalon after a competitive tender process and after beating strong competition from overseas,” he added. Each aircraft interior refurbishment will take six weeks to complete, with the first reconfigured 747-400 to commence services between Brisbane and Los Angeles in October, operating three return services per week. The remaining eight aircraft will subsequently be introduced across Qantas’s international network by the end of 2012. The nine 747-400s to be refurbished at Avalon comprise its six GE CF6 powered 747-400ERs and its three youngest RR RB211 powered 747-400s. Qantas is also reconfiguring its A380s into a new three class arrangement, but that work will be undertaken by Lufthansa Technik in the Philippines.